Marine Results has set up a workshop in Palma, Mallorca to handle the current busy programme of superyacht rig and NDT management that the company is undertaking on the Mediterranean island this winter. Activities at the new workshop have kicked off with a complete 5-year service of Kokomo III’s rig. The well-known 58.4m sailing superyacht has one of the tallest rigs in the world at 75.7m. 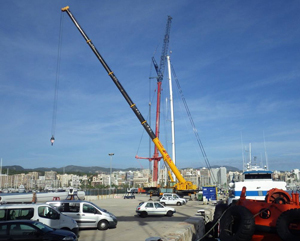 Following Marine Results management of the tallest mast ever to be unstepped in the USA, just weeks ago, Kokomo is believed to be the tallest mast ever to be unstepped in Mallorca. In fact a specialist crane had to be brought over from mainland Spain to unstep and restep the rig as there is nothing suitable on the island of Mallorca. The workshop will continue to be busy once the Kokomo III project has been completed. Service work is also to be undertaken on the rig of the 39.75m (130ft) Huckleberry during the winter 2015/2016. The 48m (157.5ft) rig will be pulled out and given a 12 year service, with inspections being carried out both to the main and mizzen masts and to the rod rigging.